I finally got my hands on two dairy and egg free products which I had been lusting after. Sadly the banana cashew and peanut butter Cat & The Cream cupcake was a big disappointment. It was dry. I could not taste the peanut butter and the frosting tasted cheap. I really do not understand why everyone has been singing their praises. My homemade Vegan cupcakes with Betty Crocker frosting are far superior. 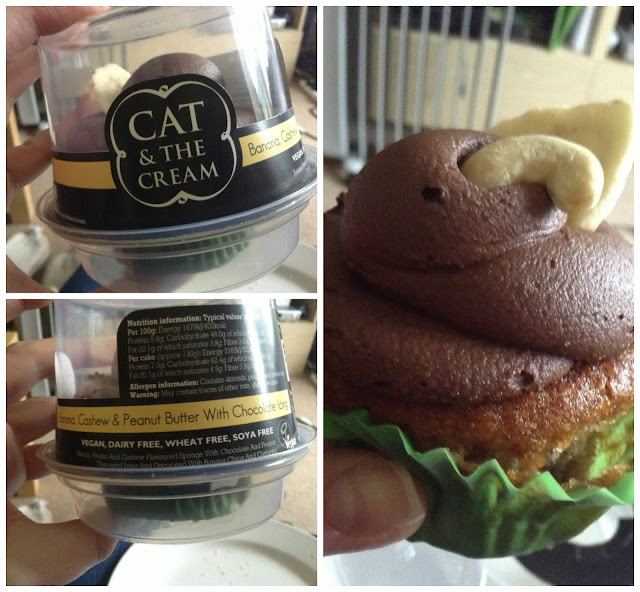 Cat & The Cream cupcakes are dairy, wheat and soya free and Vegan Society approved. Thank goodness I knew what Pudology tasted like, no chance of disappointment as I had sampled at The Allergy & Free From Show. These chocolate puds are rich and thick with a hint of coconut. They are very indulgent and a sweet tooth is a requirement! Pudology puds are dairy, egg and gluten free and Vegan Society approved. I ordered both from Ocado. The cupcake was £2.69 and the puddings £3.99 (2 pot pack). I ended up tweeting Ocado to complain that neither product listed being egg free in the Allergen Information. The cupcake is not even listed as egg free under the Product Description. When I used the "egg free" search function (in sidebar) neither of these products appear on the results. Seems silly to me as they are missing out on potential customers. I knew Ocado stocked them but if I did not then they may have been overlooked. It is reasons like this that I find online food shopping frustrating. I'd rather go to the store and read the labels myself than have to rely on a website where errors can be made. Have you tried these products? Did you enjoy them? If you have allergies, do you struggle with online grocery shopping?